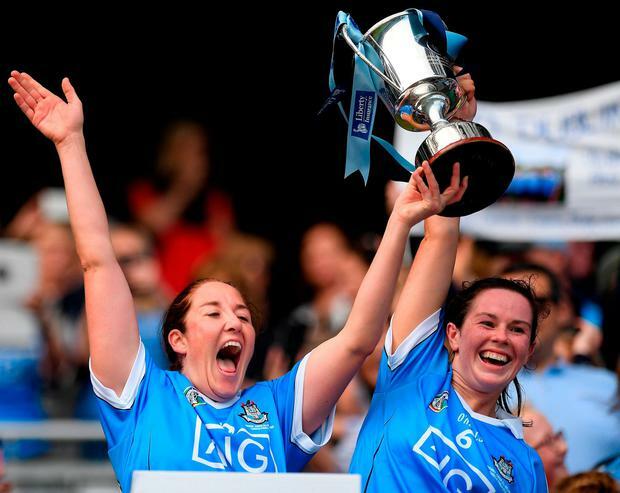 AOIFE BUGLER’S 15th minute goal was the crucial score as Dublin’s Camogie revolution continued with victory in the Liberty Insurance All-Ireland Premier Junior Camogie Final. It was redemption for the victors after losing last year’s decider but although the margin was emphatic and the pain of defeat will linger, this is only the beginning for the Kingdom, their first appearance at Croke Park coming less than a decade after the inauguration of a county team. This day was about the Dubs though. Bugler was just one of an impressive attacking cast in which Player of the Match Caragh Dawson and Laoise Quinn and the pacy Caragh Dawson shone, while at the other end of the pitch, the redoubtable Deirdre Johnstone led an unyielding defensive effort. Bugler, who was named Liberty Insurance Premier Junior Player of the Year last year despite Dublin falling short, suffered a cruciate knee ligament injury shortly after the Final and only returned for the Blues’ Semi-Final win over Offaly last month, in which she scored a goal and three points. She matched that tally on this occasion but this was an excellent team display. Shane Plowman had his team set up to pull out and leave considerable space in front of his front three, and then it was about the supply. They were well drilled in this regard and Bugler’s goal was a product of it, Quinn drilling a low ball in front of her that she gathered neatly, before turning Niamh Leen and firing high to the far corner. She almost had another from the next attack but Leen got back well to deny her and indeed, held her own in a brilliant individual duel. Patrice Diggin settled Kerry with a couple of pointed frees but Aoibhe Dillon did likewise at the other end, showing good composure in doing so having missed a couple of early opportunities. But Dublin had more firepower and added three points from play, the highlight of which was a splendid score by Bugler that combined subtlety, strength and accuracy. They led by 1-6 to 0-2 at the break and though Kerry were much improved in the second half and Laura Collins’s point after sublime stickwork from Jessica Fitzell offered a glimpse of their capabilities, they never looked like getting the goal they needed to get back into proceedings. Bugler took over the freetaking duties to good effect when Dillon was substituted and the gap remained comfortable. Kerry boss Stephen Goggin took the opportunity to give as many of his players as possible a taste of Headquarters on All-Ireland Final day, in the hope that it might stand to them in the long term. Plowman did the same and managed to get skipper Emer Keenan on in the dying seconds, having been sidelined by a cruciate ligament injury suffered four months ago. Within minutes, Keenan was lifting the trophy named in honour of Dublin’s greatest player Kay Mills, and offering classy words of comfort to the vanquished Kerry, before the celebrations were on in earnest. Independent.ie Newsdesk A survey conducted by the Women’s Gaelic Players Association (WGPA) shows that more than eight out of 10 inter-county camogie players want to trial to rule changes. Independent.ie Sportsdesk PETER WILLIAMS had to cut his holidays short, but it was all worthwhile as his Kildare camogie team produced a strong second-half display to beat Limerick in the Division 3 final. Daragh Ó Conchúir LONG-SERVING captain Sabrina Larkin has played at senior level for more than a decade for Tipperary without tangible success and there was no hiding her joy as she delivered her speech after the Premier County bagged their first Littlewoods Ireland Camogie League Division 2 title. WATCH: Who is the current Premier League top scorer? Which Premier League player is on target to take home the Golden Boot this season?